I don't know what of our tools you, our readers, use on a regular basis, but one of the things, I like to look at first when I login to isc.sans.edu is the Top 10 Ports by Unique Sources chart. This suggests coordinated (think botnets) scanning. So, I was really shocked to see port 81 had jumped up to 2nd position just behind all the Mirai-ish port 23 scanning. Take a look at the port 81 chart. If any of our readers have any insight into what is going on here since 16 Apr, plase let us know. Some kind of error in software coding perhaps, where zero being 1 has been overlooked? 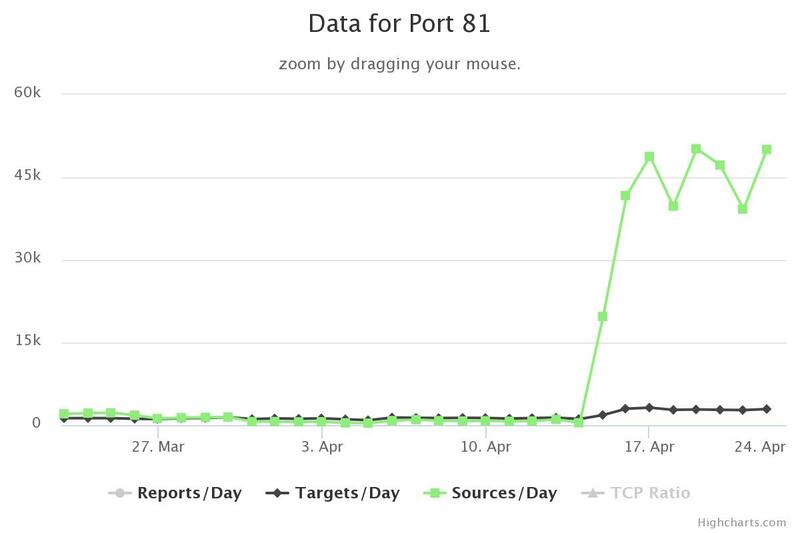 We can confirm at our organization that we're also seeing a spike in port 81 access attempts since April 15th. The only thing I have seen is public IP checksfrom checkip.synology.com via user agent "uTorrent/347". Maybe a new technique in peering? It is a new IOT botnet reported by netlab from 360 company.